As a kid, I was entranced by all sorts of freaky phenomenon: Loch Ness Monster, UFOs, Bermuda Triangle, Easter Island. I couldn't get enough. My addiction to such things was fed in part by a syndicated TV show called "In Search Of", hosted by Spock himself, Leonard Nimoy. The program was spooky but enthralling, especially for a kid. Now I'm all grown up but I still have a not-so-secret interest in such oddities. Instead of "In Search Of", I prefer "Is It Real?" on National Geographic Channel. And I love this mini Easter Island of my own making. It's rocking its way up to the top of my 'to buy' list. 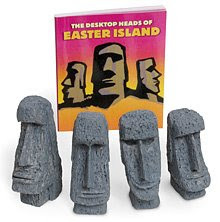 The set comes with four stone heads plus a reference booklet, so you can align yourself with ancient society & set up your own mysterious land on your desk, counter top - wherever you damn well please! Me likey!